(15/P46) TRENTON – New Jersey, consistently a national leader in ocean water quality and monitoring, is kicking off the unofficial start of summer this Memorial Day weekend with vastly improved beaches, Department of Environmental Protection Commissioner Bob Martin said today during the New Jersey Sea Grant Consortium’s annual State of the Shore event in Asbury Park. The DEP spearheads the Cooperative Coastal Monitoring Program (CCMP), a joint state, federal and local partnership that routinely tests water quality at 215 ocean and bay beaches across the state. Water quality sampling started May 11, and results have shown that New Jersey’s beach water quality is outstanding. Coastal surveillance flights, six days per week from mid-May to mid-September, also carefully watch for issues such as algae blooms or debris that might affect water quality. “We take great pride in the state and local partnerships that we’ve built to make sure that the water quality is excellent,” Commissioner Martin said. closure policy at just four beaches surrounding one stormwater discharge pipe in Monmouth County. Three other ocean beaches were closed as a precaution after an extreme storm event. The DEP has worked with Rutgers University to develop an interactive website and map that will show real-time status of monitored beaches at www.njbeaches.org. The website allows the public to easily view and download water quality data, notifies the public of any alerts at beaches, and shows the daily flight path and the chlorophyll data collected during the flights. It also includes access to a variety of reports, information about recent research, and shore-related links. Meanwhile, municipalities have done extensive work preparing beaches for the summer. Shore construction and replenishment projects are also underway to provide long-term protection of New Jersey’s shore communities with a comprehensive coastal protection system. Major shore protection projects are currently underway in Monmouth, Ocean and Cape May counties, making wider beaches, dunes and berms in those areas. In recent months, the Christie Administration and the U.S. Army Corps of Engineers-Philadelphia District launched a $128 million contract to complete beach and dune projects for nearly 13 miles of Ocean County’s Long Beach Island, including Long Beach Township, Ship Bottom, Beach Haven and a portion of Surf City; a $57.6-million project in southern Ocean City, the Strathmere section of Upper Township and Sea Isle City in Cape May County; and a $38.2 million project for Loch Arbour, Allenhurst and Deal. Two additional major, new shore protection projects are in the pipeline for Absecon Island and Northern Ocean County. Last year, eight other projects were completed to restore pre-Sandy engineered beaches to their original design at a federal cost of $345 million. These projects, which will provide much stronger protection than ever before, are being funded fully by the federal Disaster Appropriations Act of 2013. For more information about the DEP’s ongoing Sandy recovery efforts, including FAQs on beach and boater safety, visit www.state.nj.us/dep/special/hurricane-sandy. For more information about the New Jersey Cooperative Coastal Monitoring Program, visit www.njbeaches.org. 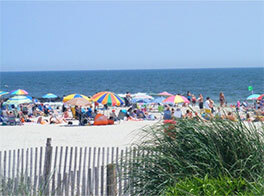 Follow the New Jersey Beach Monitoring Water Quality Program on Twitter: @NJBeachReport. For more information about the Sea Grant Consortium, visit www.njseagrant.org.